What do Benedictines have to do with Burning Man?. Well, not much. 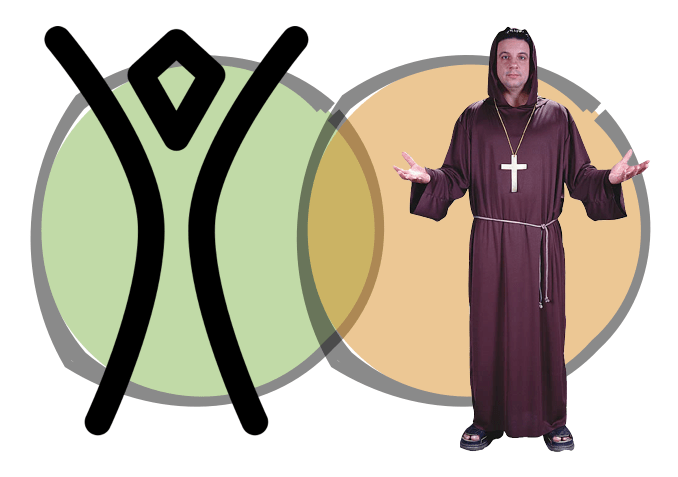 It is a Ven diagram with very little overlap ( I think I’ll wear my leopard skin habit with the blinky hood? #notsomuch). But there is a reason I live happily wedged between these two very self-conscious groups of trouble makers. And as we tip-toe across these last few hours of ordinary time and into a new season (meaning different things to each community) I have been compelled to really reflect on what is happening in my life because I how I live with these people and all of their, well, religious practices. innovation, art, and engineering. That cooperation and effort gives shape to things otherwise only in our dreams: cupcakes you can drive, fire breathing goat-buses, and victorian houses on wheels with a steam punk brass ensemble which features a flaming tuba. If you think I am making this up you probably have not been to Burning Man. If you close your eyes and think of something bizarre which simply cannot exist, it was probably there on wheels and serving pancakes last year. Especially in Austin, early spring becomes a time of wild art forging in backyards, basements, and at the warehouse collectively rented by the ‘burner’ community. At the end of may we will have conjured up a kingdom made of imagination, steel, fire, sugar and EL-wire. There will be performances, not just rehearsals, but enactments of a world we are still making. There is a strict code of principles which is pretty thoroughly enforced by the whole community. We will spend the spring rousing our desires, thinking of others and working to offer something new to friends we haven’t even met yet. When we get there we will all be together watching some of the great work of our hands disappear into fire and time. Then there is this other community of costumery and performance to which I belong. For them, wearing black habits and sharing a rhythm of life, work, and prayer is not buying into a genre, it is living in community. It is the building of a present and future kingdom that very much names who we are even today. This Wednesday we will also burn things and even rub those ashes on our face and say,” …we aren’t there yet and one day I am going to die. better keep going.” And we will work with each other, and for friends we haven’t met yet, to build that kingdom. It is a language, a code of virtues and ideals, practices and a list of things we want to get done before the day arrives. We pray together, do the chores and mutually prod each other on letting the love of God and others be our only center, the only focus of our lives. In terms of hope, work, and a shared imagination, these communities are very much alike. We need people to be eccentric, off center, because right now “the center cannot hold.” In the past couple hundred years we have made it our mission to all be ‘an individual.’ Unfortunately we have defaulted to doing this as consumers, purchasing the trinkets of our identities online and in boutiques, so that now everyone is so unique that we all start to look just like each other. We share a wardrobe and a lingo, but without the true practices of community that can shape us and nurture our truest selves. Im not saying more Christians should be burners. Actually I have grave reservations about that as a project. I feel quite certain St Benedict would have no real interest. And not everyone should be a monk. I am sure my burner friends agree. But we all have to make our way to history’s version of Grandma’s Attic, or to life’s great toy chest, to dig through its heirlooms and oddities to find out more about who we are, and more importantly who we could be with a little help from our friends. We are not just individuals. But with our unique gifts, we are building each other’s lives, and others are helping us build our own. This is a good season for us to reflect on what we want our lives, and other’s, to look like. Just who do we think we are? Calling all artists: hop in your potato sack race to the edge of the known universe to see if there is more. Cheer each other on and name yourselves as camps, fools and prophets. Wear your shoes on your head and paint targets on your hearts and other’s. Beloved, let us also dig the mines of our faith. Let’s befriend the saints of our inheritance. We will scavenge what is old to fashion wisdom for today. Rub ashes on you forehead. Read in dead languages and if you dare, pray. Above all, do those thing you do which bind you together in community for there the delicate nuances of why God gave you to the world will begin to shine through. In doing so we might together discover the depths and breadth of what we can become. And for posts about Burning Flipside Burners from Austin, TX. Eat at Joe’s: A beautiful story about what happens when a band of misfits and atheists get their hands on the Feast of St. Joseph. Its Burning Flipside season in the ATX, so stay tuned for some relfections on our burn, It’s a time machine theme this year so I might actually meet St Benedict in person. …yeah, pretty good chance I’m gonna blog about that…. Is This Seat Taken? My night as the welcomed stranger among the even stranger at a Passover Seder. You’ve probably seen this article—shoot, you probably brought it to my attention—but it seems on point. After wanting to go to Burning Man for years, I half-jokingly referred to my first trip there in 2009 as “the hajj.” On reflection, it was less than half a joke. Actually Adam, I had not seen that article. Its great. Also the line I reference “Theatre in a Crowded Fire” is that book by Lee Gilmore on Ritual and Spirituality at Black Rock. As a religion scholar with a little emphasis in ritual, it was overwhelmingly fun being there. I thought my head would explode with ideas for articles while there. So just short of my head exploding I do unapolagetically participate if for no other reason than this is still a bunch of people who create culture. Its not only mind blowing, it maybe the freaks and artists who save civilation. In case of a Zombie Apocalypse the two places I would run first would be the Burner Warehouse in East Austin or my Monastery in California (http://www.saintandrewsabbey.com/), whichever was closest and not infected. While Burning Man may not say much to Benedectines, it surely has much to say to Western Christendom, as I argued in an interview with Ian Mobsby: http://www.emergingchurch.info/research/johnmorehead/index.htm. Thanks for the post John, and especially the link. I am pretty active in the Burner community in Flipside. Again, I think there is very little overlap but a very very important conversation that needs to happen. It is why, at the risk of my own soul 😉 I keep going. I think it is more than just Burners exclusively but artists in general…. dangerous. I had a chance to skim that interview. Total fun. I don’t mention it here but I am an academic by training. Both in religion and theology. One might say I am an ivory tower anarchist. We talk a lot about TAZ’s around here. I hope perchance one day we end up in the same city and can sit down over tea and/or Texas Brisket and compare notes. Thanks for the link. I very much enjoyed your post! Thanks for following the trackback and leaving a comment. Be well and have an awesome time at Flipside! My friend and I dressed up as Monks and hitched hiked across the US!